Myint Myint Tin, Phyu Mon and Zoncy represent three generations of women artists devoted to making women’s voice heard in the artist community in Myanmar. Each of them has been influenced by the political context in which they have grown and developed as artists. The carefree images in Gecko Stories, inspired by Zoncy’s youth and the joyful games she played with her sisters and grandmother contrast with the Survival Game’s series, where she represents the daily challenges and adversity faced by families in Myanmar. The three series reflect a critical look at Myanmar society through women’s eyes. Facing a never ending political transition and consequent disenchantments, they find solace in creating the “sidewise world” they would like to live in. In this exhibition, their art becomes a machine to travel through time and space in a playful way. Fond of chronicles, Wunna Aung recreates historical characters who endured difficult times, passionnated about the interstellar universe, Thu Myat depicts a cosmos inhabited by aliens and gods, frustrated by the world he lives in, “Bart Was Not Here” creates a Temple of Escapism, inspired by what he calls a “God Complex”. This exhibition encompasses three colourful and witty new series of paintings and a collective artwork revisiting pop-art and mural tradition. ​This exhibition is a duo show by Hélène Le Chatelier (France) & Ji Yue Deng (Singapore) reflecting on the current "culture of now". Both Hélène and Ji Yue question the relentless and ubiquitous recording on social media. As highlighted by Hans Ulrich Obrist in "Somewhere, Totally Else": "external digital memory lacks emotional elements". 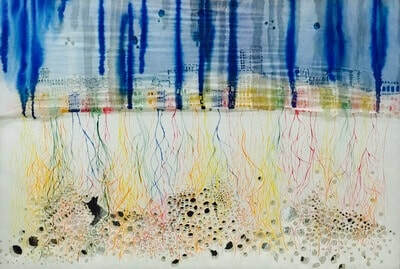 Quite the opposite, Hélène's "Instant Ink" series archives emotional snapshots, while Ji Yue's monoprints and lithographies strive to reconnect the viewer to the affective awareness of his own existence. Trained in Paris, Hélène Le Chatelier lives and works in Singapore since 2010. Trained in China and in UK, Ji Yue has recently moved back to Singapore, "Here, Somewhere, Totally Else" is her first exhibition in Singapore. Slide & Tongue is a synthesis of image and text that revolves around the theme of everyday minimalism. The images are characterised by geometrical lines and the use of colour. A haiku, which accompanies each image, functions as a creative caption. Haiku was chosen because its compact form carries similarities to the minimal lines and emotive states evoked by the images​. 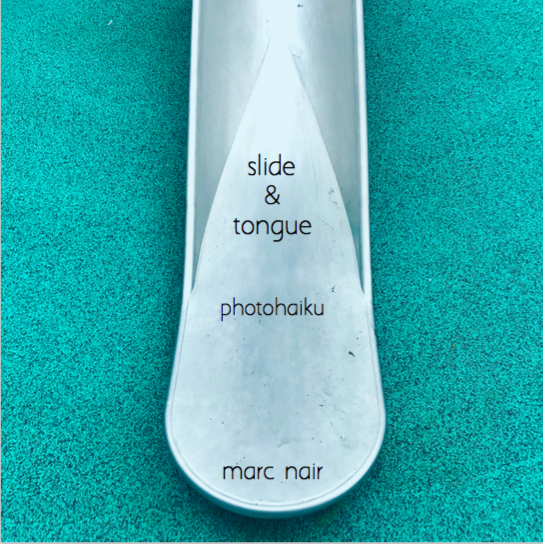 The title of the exhibition refers to the physical slideof childhood playgrounds, but it also considers the slide as a tongue;an implement of speech. This duality of speech-seeing frames the exhibition, allowing the photographs and haiku to engage each other in a reciprocal dialogue. This exhibition presents a selection of paintings and mixed media by contemporary artists from Myanmar. ​These “Burmese Vignettes” refer to the recent history of the country and illustrate events and traditional beliefs. Ultimately, “Devotion & Protest” strives to capture the involvement of the artist community in the long and winding road to democracy in Myanmar. Scents of Asia brings together artworks by selection of artists using different mediums and metaphors to talk about Asian history and identity. ​Although individually disconnected, altogether these artworks create a mosaic which reflects the flavour of Asia. Senses & Lenses by Claire Deniau encompasses 12 artworks, which highlight the link between art and vision, the result of an unprecedented collaboration with Essilor, leading manufacturer of optical lenses. The artworks are based on the transparency of the mineral lenses, which, placed in front of a painting, bring a new dimension due to a magnifying, deforming or narrowing effect. The viewer is invited to immerse into the paintings’ fusion of colours, materiality and gesture to interact via the senses, in order to “feel with the eyes”. ​We propose you to discover Singapore’s cultural roots through artworks by Armenian, Malay, Chinese and Indian artists. This exhibition encompasses artworks which reflect the artists' personal histories and identities. Kachin means “Red Earth” in Kachin language. With Red Peace, Ko Z strives not only to keep memory of the tragic history of the Kachin people but also to express his hope for peace. Red Peace encompasses paintings on canvas, photos, drawings by children living in IDP camps and an installation. Red Peace paintings look like stained-glass windows. However, they are also inspired by the traditional patterns of the totem poles, which are erected during the Kachin Manau Festivals. A Manau festival is traditionally held to mark various important community events such as weddings, funerals, declarations of war and victory celebrations. In this series, Ko Z successfully appropriates visual elements borrowed from European modernism, in particular from cubism. However, this series is deeply rooted in Kachin pictural tradition and celebrates Kachin identity. I Wish I WERE Here, Writing, Erasing, Recomposing, Expanding. 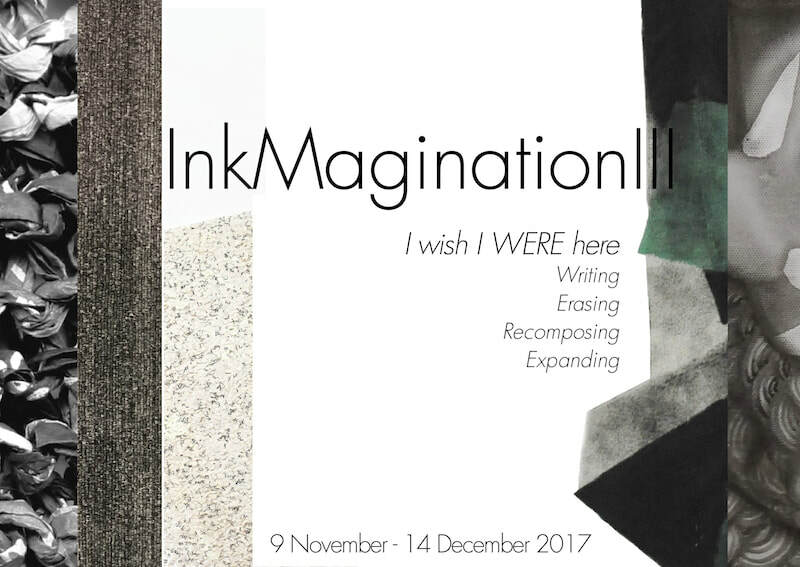 The third edition of InkMagination continues exploring contemporary ink art in the practice of Singaporean and French artists. Though rooted in a different cultural background their practices intersect through the common ink medium. I Wish I WERE Here, Writing, Erasing, Recomposing, Expanding, focuses on memory and on the role of the artists in writing personal and national history.